The IBM WebSphere Business Integration for Healthcare Collaborative Network is an internet-based, private information network that enables secure transmission of clinical data to healthcare participants. Healthcare Collaborative Network enables immediacy in the dissemination of clinical data and provides participants with capabilities to detect and respond rapidly to health risks such as adverse drug effects, to manage quality of care, and to implement monitoring and warning systems for detecting the onset of dangerous infectious diseases or bioterrorist attacks. 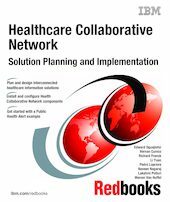 This IBM IBM Redbooks publication provides a first-hand guide for creating solutions based on the IBM WebSphere Business Integration for Healthcare Collaborative Network. It includes an example scenario of a public health alert based on Avian Influenza (bird flu) and Avian Influenza A (H5N1). Healthcare Collaborative Network is aimed at hospitals and large groups of medical or dental practices, international and government agencies, pharmaceutical companies, and major insurance companies.